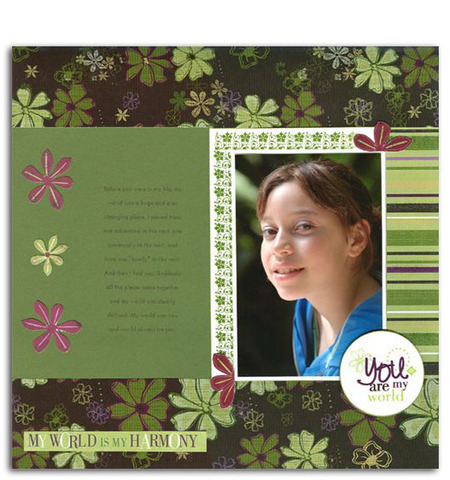 For this challenge Mel used the Deja View TidBits Storybook to create a mini album all about her daughter Bella. The 8X8 Paper & Punch-Out tablet in Blue Raspberry was perfect for this project. Everything is contained in the tablet - papers, mini & large alphabets, die cut flowers, tags and even words, so all she had to do was punch out and adhere down - so easy. "Perfect" was Jaimie's comment when she saw the sport range of papers from Deja Views. 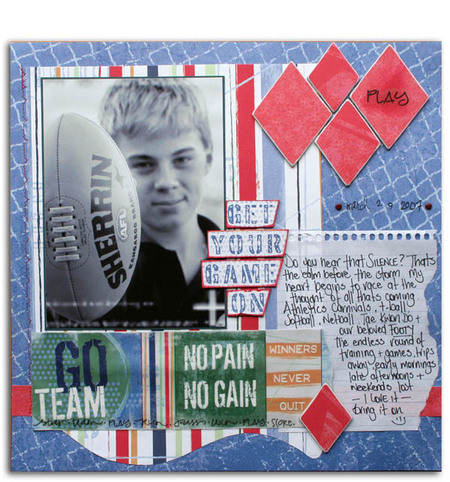 The mix of paper and vellums as well as the addition of covered chipboard accents and note paper for journaling completes this sporty, masculine layout. 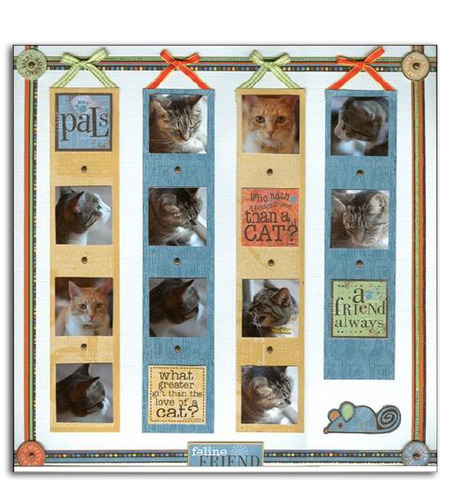 This feline friend scrapbook layout was also created by Sue Thomas (we have been very spoilt with her layouts for this challenge). We loved the long strips containing photos and cat statements and how cute is that little mouse from the Deja Views range!! 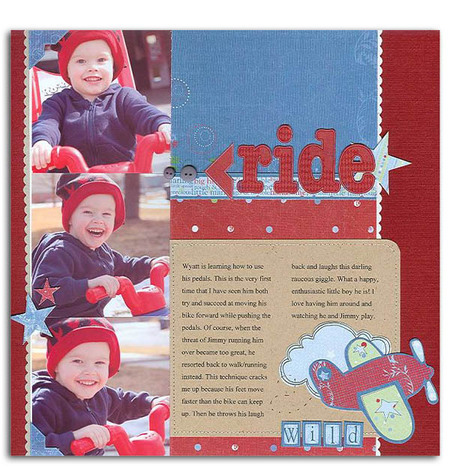 Jen Gallacher's stunning 'ride' layout caught our eye immediately with it's rich colour combination of red and blue. The photos are so cheeky and cute and match the fun boyish feel perfectly. A big thankyou again to Sue Thomas for allowing us to use these three gorgeous pages. Sue's work was standout and she has shown to perfection just how to use the Deja Views lines. 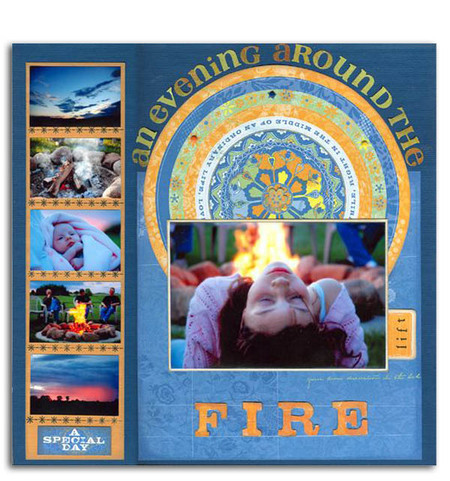 "An evening round the fire" showcases perfectly the colours of the Fresh Prints range. The colours are amazing and Sue's circle and main photo is simply stunning. 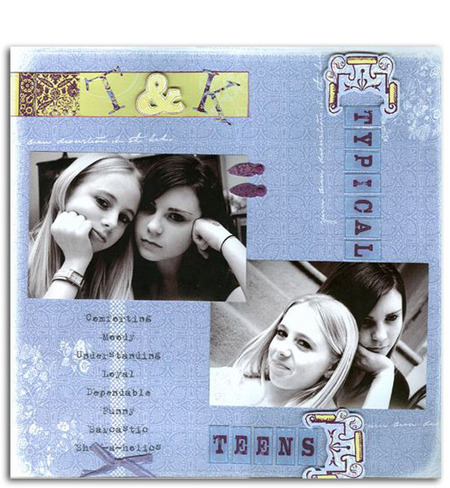 The cool blue tone on the "Typical Teens" Layout is subtle and striking and gives great emphasis to the B&W photos she has used and we all felt the tenderness of Sue's "you are my world" page, the simplicity and elegance really shines through with total focus remaining on her heartfelt journaling and photo.